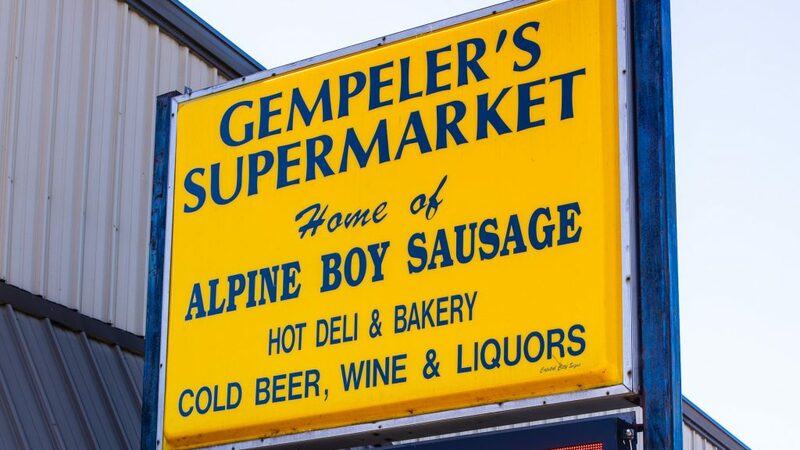 Gempeler’s Supermarket is an independent, full-service grocery store proudly owned and operated by Ernie & Sharron Gempeler and their children, Ken and Connie. In 1972 Ernie & Sharron purchased Streiff’s Grocery, owned and operated since 1945 by John Streiff of Monticello. The Gempelers previously ran a dairy farm operation just outside of town, so they jokingly say they moved up a step in the food chain! When Gempeler’s Grocery opened for business on April 10, 1972, it had three aisles, one cash register, and a half dozen employees. One year later, Ernie & Sharron purchased and remodeled the adjacent, vacant building formerly occupied by Karl’s (Duerst) Meat Market, which doubled the size of the grocery store. In 1986, Gempeler’s grew again, this time tripling in size with the purchase and renovation of the remaining two buildings on the block: the Village Tap tavern and the vacant Krieg & Zurbuchen building. 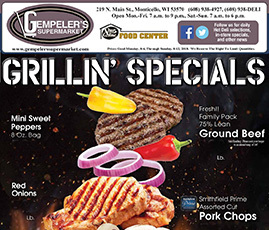 Today, Gempeler’s Supermarket offers shoppers a complete line of groceries & frozen foods, fresh produce, dairy, hot & cold deli, bakery, made to order pizza and sub sandwiches, and a full service fresh meat counter. What has never changed at Gempeler’s is our commitment to offer quality products at a fair price, and our dedication to providing friendly, hometown service to each and every customer.